Abstract: This thesis explores the ways in which horses were bought, sold, traded and otherwise exchanged in late medieval England. The first chapter involves the comparison of two large estates ca. 1300 in England, one in the north of the country and one in the south, and how they dealt with issues of horse procurement and disposal, mostly for agriculture, revealing in the process their connection to the market and with prevailing managerial mentalities. The second chapter examines the wealth of material surviving in calendar form from the royal chancery over the period from the thirteenth to the fifteenth centuries and explores the trade of elite horses. Together these two substantive chapters endeavor to see how the movement and exchange of horses in medieval England might be revealed through these two specific case studies. Introduction: Rivaled perhaps only by the medieval knight, horses evoke some of the most familiar images associated with England in the Middle Ages. 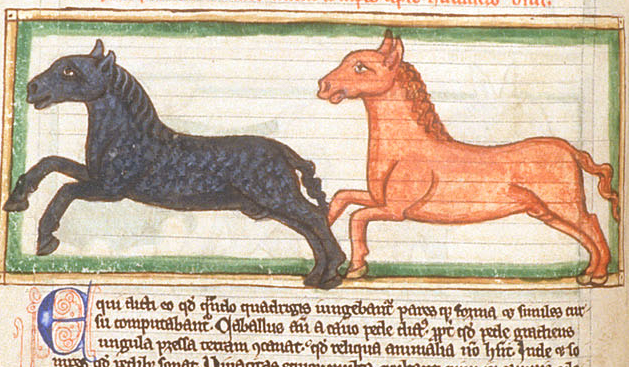 While the man atop the horse has received much scholarly attention, the study of the animals themselves has largely slipped through the historiographical cracks, particularly in terms of how horses were bought, sold and traded in medieval England.